As an Android user, you would have notice a magical expression “Ok Google”. When you utter these words, a new world of immediate information gets unlocked for you. It sounds amazing, but most of us are thinking that what are the limitations of Google Now? How many questions can we ask Google? To reply this, we’ve collected a Google voice commands list which is attuned with the Google Now. It is pretty broad list, however we persuade you to have a look on the whole list and attempt these commands out for yourself. There are thousands of questions which is asked and searched on Google by the people. Everyone search as per their expectations to know something. These questions may belongs to all the possible occurring in the universe. Not only this you may also ask google about the histories when Google was not there as well as about technologies, market, movies and much more. Google will reply you with the perfect result. Here in this article we have collected all the possible answers you get by Google Now when you ask something to Google. 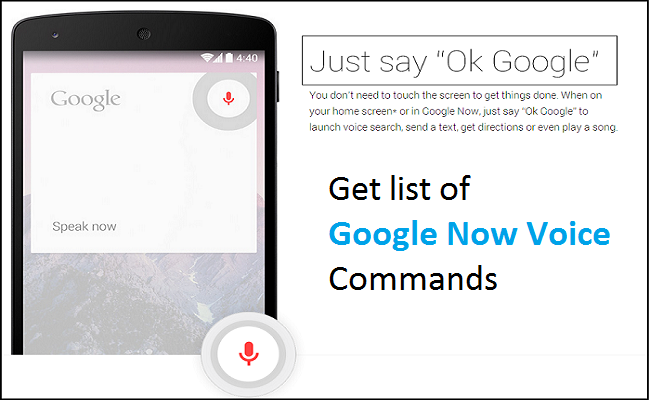 Below are Google now voice commands list or voice assistant. “Find (phone number).” – this way you may explore for a contact info. “Where is my package?” – it only functions if tracking is applied through Gmail. “Take a picture”/ “Record a video”.